Although not as famous as Uttarakhand or Himachal Pradesh, there are some wonderful locations for trekking in Karnataka. For those living in this state, these options for trekking near Bangalore will be perfect for a quick getaway from the city. Some of the most popular destinations to try trekking in Karnataka are close to Bangalore. If you’re looking for trekking near Bangalore, you might want to consider the following options. Nandi Hills is a popular day trip option for trekking near Bangalore. It is named after the bull of Lord Shiva, and there is an ancient sculpture of this deity at the foot of the hill. There is a wonderful rocky surface at the top, and about 1000 steps cut into the hill, and you’ll have a good climb with views of the horizon all around. Yet another good option for day trekking in Karnataka, this option for trekking near Bangalore sees plenty of adventure seekers every weekend. It’s only about 50 kms from the city, and has plenty to see. You can stop to admire the Shiva temple at the foot of the hill, before climbing to another Shiva temple at the top. There are steps cut into the rock, leading you up to the caves that you can explore. This trekking route is about 120 kms from Bangalore, so is not a popular option for trekking in Karnataka. This location is named after the Pandavas who are believed to have lived here during their exile. There are two hills to clamber over, with views of paddy fields all around, as well as a temple at the foot of the hill. You can expect a challenging climb, with some steep ascents to conquer. This is a popular location for trekking in Karnataka, and lies about 250 kms from Bangalore. It is ideal for a two or three day getaway, as you can do one day of climbing, and spend the rest of your time in the forest reserve that Kumara Parvatha lies in. This is one of the toughest locations for trekking in Karnataka, so make sure you’re well prepared. If you’re looking for an offbeat option for trekking near Bangalore. You’ll get to combine the fun of an easy trek, with some cave exploring too. A natural spring rises in the hill, and flows through the statue of a bull that is in a temple here. The caves are usually cool and dim, and provide a welcome respite for tired trekkers. This lakeside location is perfect for trekking in Karnataka. It is close to the Shivanasamudra Falls, and attracts plenty of tourists year round. But on the trek, you’ll escape the crowds and enjoy some blissful solitude. Because it lies in the midst of a lush forest, you’ll find plenty of trails for trekking in Karnataka starting here. There are also some wonderful spots for angling and bird-watching. Trekking in Karnataka can get very hot in the summers. However, in the rainy months from mid-June to late September, you’ll find the trekking near Bangalore is cool, green and misty. You can also go trekking in Karnataka in the winter, between December to early February, but be warned, it can get very cold! Ensure that you have a good pair of shoes and a trusty bag for any trekking in Karnataka. Carry at least two bottles of water per person, and a few snacks. Do carry a powerful sunscreen lotion or spray to save your skin, as well as insect repellent. If you’re going trekking near Bangalore in the monsoon, carry the right rainwear. If you’re going trekking in winter, dress in layers to stay warm. This moderately challenging trek to Kunti Betta is great for a day trip or a night trek. The rocky structure of the hill offers some tricky stretches where you will have to clamber over boulders. All along the trek to Kunti Betta, you’ll get scenic views of the landscape around, as well as of Thonnur Lake below. 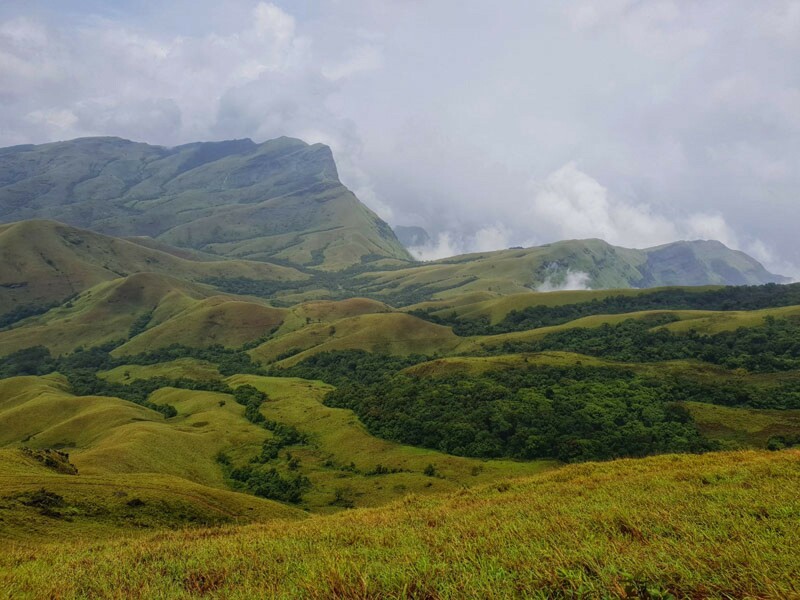 The trek to Kudremukh takes you to the second highest peak in Karnataka. The unique peak is shaped like a horse face, and is located inside Kudremukh National Park. The trek route winds through gorgeous greenery, with waterfalls, farms, and pretty forests all around. The Kudremukh trek is usually done over 2 or 3 days. The Kodachadri trek itinerary includes a visit to Hidlumane waterfall and sometimes a stop at Nagara Fort too. The trek route goes through a dense forest, with some steep sections. In the monsoon, you’ll have streams running by underfoot, while in winters, the misty views from the top are absolutely spectacular. The Kodachadri trek usually takes place over 2 or 3 days. The Antargange trek has plenty of fascinating things to explore. It is a field of rocks, where boulders are stacked on top of each other to form cave-like structures. It is also home to an ancient temple with a mysterious Nandi statue that has a stream flowing from its mouth. Nobody has been able to trace the origin of this stream, and the temple is a popular pilgrimage spot even today. The Antargange trek is usually done overnight, to allow you to camp at the top and watch the sunrise. The Narayanagiri mountain is a 3800 feet climb, with natural caves and a thick forest to explore. You’ll also see the Laxmi Narayan temple and the remains of the fort around you as you climb. The trek is close to Manchanabele, where the backwaters offer some fun kayaking and swimming opportunities. The Narayanagiri trek is usually done overnight, with a campfire and sleeping bags under the stars. 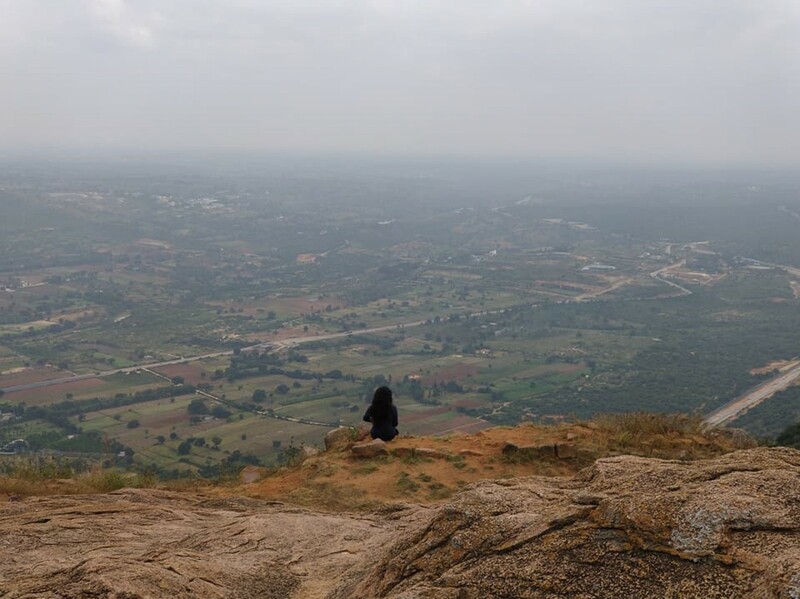 The Makalidurga trek is about 2 hours from Bangalore, and is a popular trek for those looking for a quick escape from the city. It’s not too hard too, and beginners often start here. 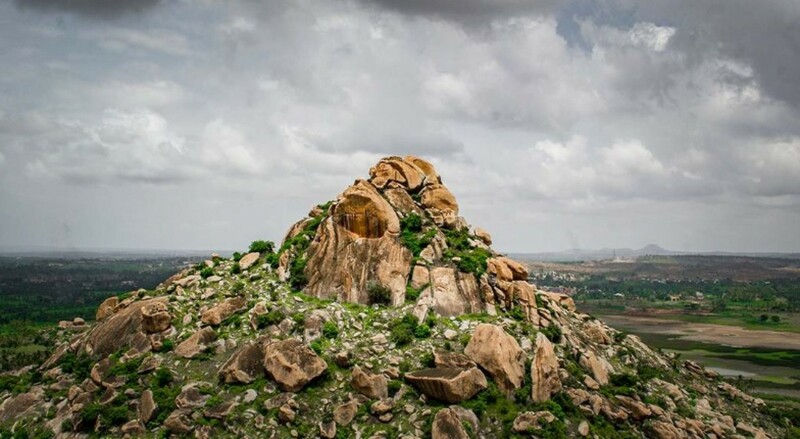 From the top of Makalidurga, you can see the Gundamagere Lake, explore a temple built for Lord Shiva, and walk along the remnants of the fort. Ramanagara is about an hour’s drive from Bangalore, and is a popular spot for rock-climbers and rappelling trips. The craggy, rocky landscape makes it perfect for photography, adventure, camping, and lots more. Some itineraries for the Ramanagara trek include a short trek and rappelling too. If you’re staying out for the night, you’ll enjoy a campfire and sleep in sleeping bags under the stars. Bilikal Betta is a hill in the middle of a nature sanctuary, about 70 kms outside Bangalore. The trek starts off in open grounds, and climbs through thick forests, until you reach the summit. There is a temple at the top, with beautiful views in all directions. This trek is often done overnight, to give you a chance to catch a gorgeous sunset and sunrise. This large mountain trek is one of the lesser known treks around Bangalore. You’ll trek through forests, passing streams and waterfalls as you go. The Tadiandamol trek itinerary sometimes includes a rafting session in the nearby Kushalnagar too.